Welcome to the website of I.P.S Horse Group. Through this site, we want to bring our company closer to you. On different pages, we bring you up to date on our objectives and services. Through the latest news on the front page of all the news we keep you informed. Should you have any questions or comments after visiting the site than you can always contact us. 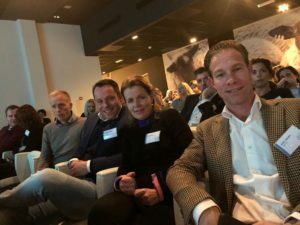 Welkom op de website van I.P.S Horse Group.Via deze site willen wij ons bedrijf nader aan u voorstellen. Op de verschillende pagina’s brengen wij u op de hoogte van onze doelstellingen en diensten. Via het laatste nieuws op de voorpagina houden wij u van alle nieuwtjes op de hoogte. Mocht u na het bezoeken van de site nog vragen en of opmerkingen hebben dan kunt U altijd contact opnemen. 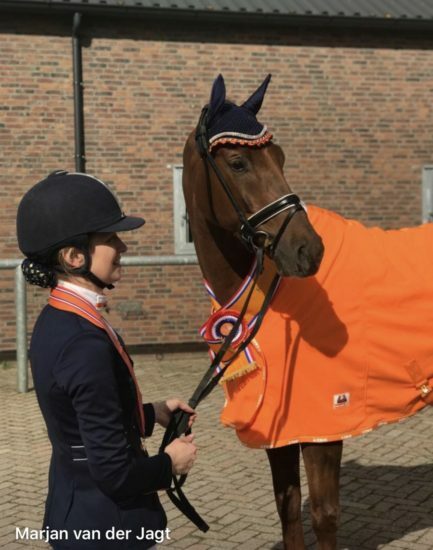 Bon Bravour’s nakomeling Jager’s Irish Coffee met amazone Marja van der Jagt kampioen KNHS indoorkampioenschappen 2019 Horka prijs M1 !! 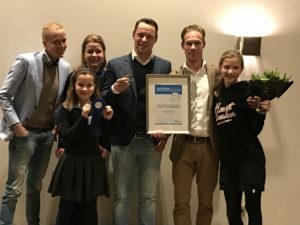 ERMELO – Vandaag werd in Ermelo bij de paarden o.a. 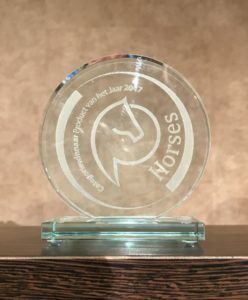 de klasse M1 verreden tijdens de KNHS Indoorkampioenschappen 2019. De winnaar van de Horka Prijs M1 is het Jager’s Irish Coffee (v. I.P.S Bon Bravour) met amazone Marjan van der Jagt. Met een prachtig mooie score van bijna 71 %. Op plaats 7 eindigde eveneens een I.P.S Bon Bravour nakomeling, Gant met amazone Rachelle buiging met bijna 68%. BERLICUM – Today it was time for the first learning/experience round on competition ground for I.P.S Kratos (v. Painted Black, 2015). Although his excitement he act really well under rider Wouter Kleemans. 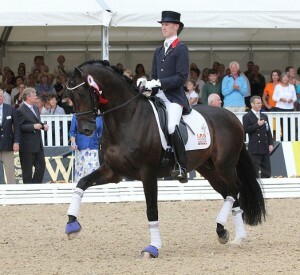 Potential is there for this 1.74 mtr son of Painted Black. 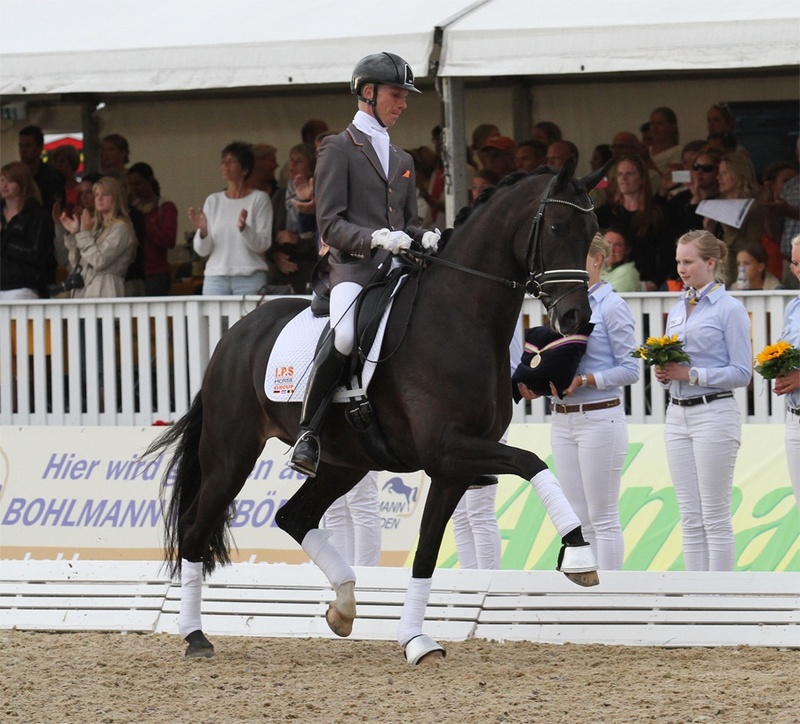 BERLICUM – Today rider Tom Franckx took our young talented big mare (1.74 mtr) I.P.S Javea (v. Bon Bravour) for a practice round to a dressage horses talent test in Berlicum. They showed already a lot of talent although still needing time for development on few things. 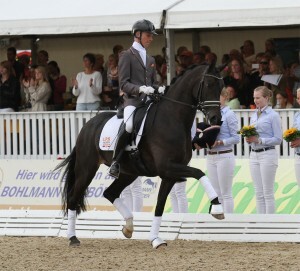 HULTEN – Today I.P.S Hilton with rider Wouter Kleemans scored 67% at (dutch Z1 level) with a good performance. This was only their 2nd time performing at this level. This I.P.S Bon Bravour son out of the famous Grandmother Poetin (Sandro Hit x Brentano II. 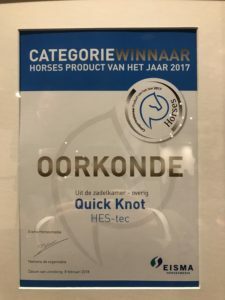 Quick Knot WINNER of Horses Product of the Year 2017!!! 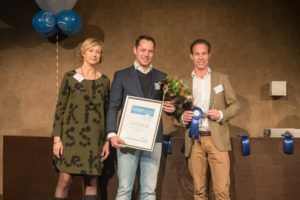 APELDOORN – Tonight was the award ceremony of Horses Product of the Year 2017 at the Van derValk’s Cantharel in Apeldoorn. There 11 different categories with in total 79 competitors !! useable for the whole horse branche!! Also we were nr 1 with the “audience”, so hereby we would like to thank the voters as well!! Beside WINNING the Horses product of the year, we are also nominated along with 2 other companies out of the 79 for best company of the year. Unfortunately we became nr 2, which is actually very good for an 6 months old company. Underneath you’ll find some pictures of the award ceremony.